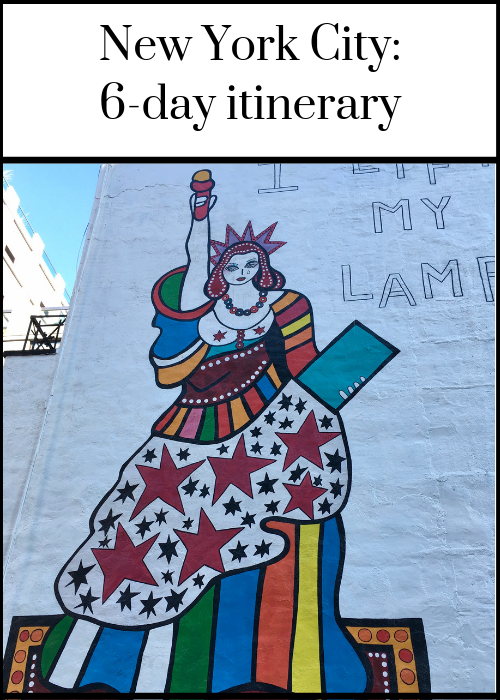 I’ve enjoyed visiting New York City a few times with my family, but recently (thanks to my husband covering teen and dog care duties) I was lucky enough to be able to spend a few marvellous days there with friends. We spent hours in museums, art galleries and junk shops, and we tried different eating places each day. The weather was sunny but very cold, and we explored the city mostly on foot, walking for miles. New York is on the USA’s east coast and is around a seven-hour flight from London. More than a third of the city’s inhabitants were born outside the US, and it’s a vibrant place which is known as the nation’s cultural capital. There’s a wealth of interesting things to see and do in New York, so it’s good to plan your visit to make the most of your time there. I was given a New York CityPASS to use on my trip, and it was brilliant for sightseeing and saved us a lot of time. The pass gave me and my friend access to six popular attractions* and it meant that we didn’t have to queue to buy tickets. Of course, we also visited places which aren’t covered by the CityPASS. Here’s an overview of our itinerary (with thanks to my friends in New York for their tips and recommendations). I flew from London Heathrow to New York JFK on a morning British Airways with a friend. (We’d booked a flight from Gatwick but it was cancelled). We arrived at JFK at 11.30am and it took about an hour to get through the immigration checks. We were travelling with just hand luggage. We took a cab from the airport to where we were staying in Manhattan. We used the airport’s official service which has a fixed fee of $52 plus taxes, tolls and tip, which came to $70. We were staying with a couple of friends who live near Washington Square, between Greenwich Village and West Village. Once we’d arrived at our friends’ apartment, three of us headed to the High Line on foot. The High Line is a public park which is elevated above Manhattan. It’s 1.45 miles long and is built on the site of a former railway track. The park is a combination of nature gardens, seating areas, public art and design spaces. Walking along the High Line in the chilly spring sunshine was a good way to combat jet lag. (There’s a five-hour time difference between London and New York). We walked from Gansevoort Street to 34th Street, stopping at various points along the way to take photos of the views and the street art. It’s free to access the High Line. We had dinner at John’s Pizzeria on Bleecker Street. John’s was founded by an Italian, and uses traditional coal-fired brick ovens dating from 1929. Seating is in old wooden booths, etched with graffiti, or at long tables, and the atmosphere is cosy and convivial. We shared an enormous and delicious pizza and a pitcher of beer between four. The National September 11 Memorial & Museum is at the World Trade Center and honours those who died in the terrorist attacks on September 11th, 2001 and on 26th February, 1998, as well as those who tried to save others in the attacks, and remembering those who survived. We walked to the site from Washington Square and skipped the queue with the CityPASS to enter the museum. We spent four hours looking at everything inside. It’s a very respectful place and I think that it gets the balance right between remembering those who died, explaining what happened and putting the events in context. Our visit coincided with a moving bagpipe tribute by a couple of members of the city’s emergency services. 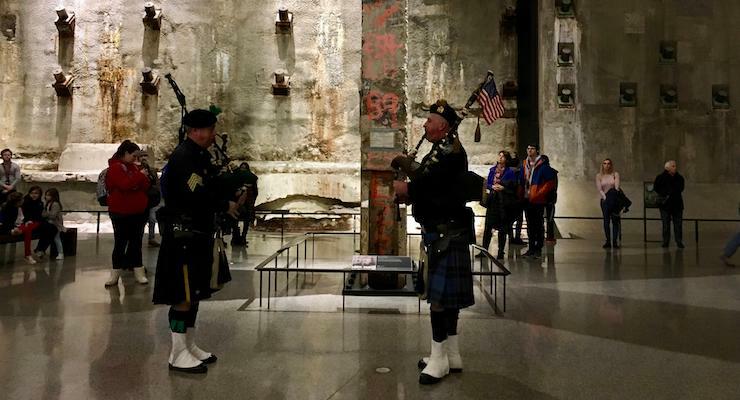 The pipers played by the giant steel beam which survived the towers’ destruction and is inside the museum. This tribute happens on Wednesdays at 1pm. The museum building sits in the space between where the twin towers once stood. The footprints of the towers are now two enormous pools, with the names of those who died in the attacks engraved around the edges. Except for when it’s too cold and icy for water to flow, as it was when we were there, water pours down from the rims of the memorial pools into a central void. We had panini and coffee for lunch in the museum cafe, and it was all good and tasty. For dinner we went to Japonica on University Place for sushi and sake. Japonica is a popular restaurant and people were queueing onto the street when we arrived. While we waited for a table we popped to the bar next door for a drink in the warm. The sushi was excellent – I had a meat-free bento box with a bit of everything. 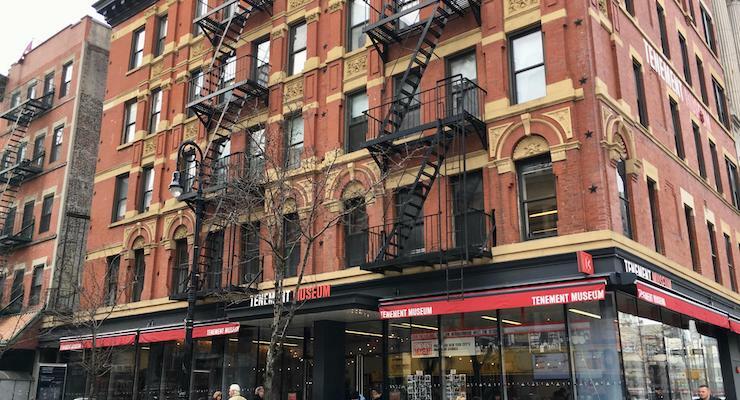 The Tenement Museum is housed in some historic tenement buildings on Orchard Street on the Lower East Side, and it tells the story of immigration to New York. It shares the experiences of an array of 19th and 20th century immigrant families through restored apartments and guided tours. The only way to access the apartments is by joining a timed tour, so it’s worth finding out about the different tours before you go. We went on the ‘Under One Roof’ tour which focuses on the 1950s and 1960s. It was interesting, but I’d really like to go on the ‘Hard Times’ tour which looks at the lives of two families from the 1870s to the 1930s. I’ll have to go back another time to do that! We walked to the museum from Washington Square, and then on from there to Brooklyn, via the Williamsburg Bridge, which spans the East River. From the Brooklyn side of the river there are some great views across to Manhattan. We had a very good lunch at Rabbithole Restaurant on Bedford Avenue – I chose homemade artichoke soup and bread, and it was very tasty. After lunch we strolled around Williamsburg and browsed some junk shops before taking the subway back uptown. Dinner was at the marvellous Tacombi on Elizabeth Street, a Mexican restaurant in a garage-like space. The venue’s centrepiece is a vintage VW camper van – which is how Tacombi started off, in Mexico in 2006. The traditional Mexican menu uses fresh organic ingredients which are sourced as ethically and as locally as possible, which means that the food is delicious. This is a very popular place, so you need to book ahead. It was another cold, sunny day and we took the subway to the World Trade Centre, then walked to Battery Park to collect our tickets (covered by the CityPASS ) for the Statue of Liberty and Ellis Island boat tour. 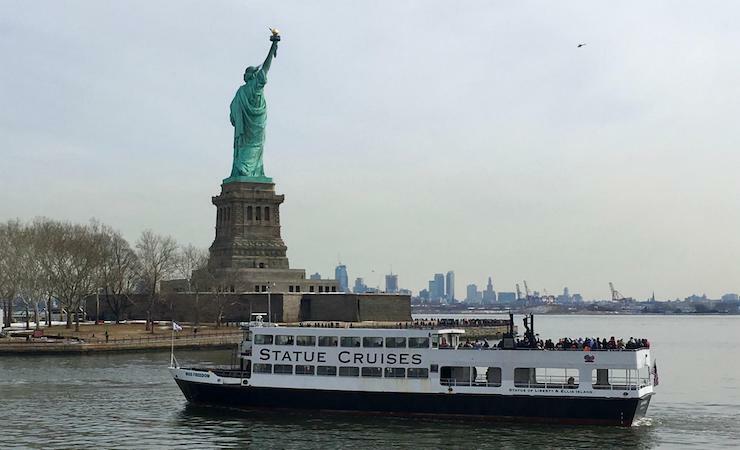 The boat’s first stop was at the Statue of Liberty. Most people disembarked here, but we decided to stay on board, as we’d taken photos of the iconic landmark from the outside deck, and we were more interested in spending time at the next stop, Ellis Island. Ellis Island is where millions of immigrants (including some of my husband’s relatives) arrived between 1892 and 1954. The Ellis Island National Museum of Immigration shows how immigrants were processed and welcomed, why they came and what they brought, and it also looks at the wider context of immigration. I found it a fascinating place, and we were there for several hours. The museum is fantastic but its cafe, not so much. My panini had a very unpleasant taste and texture, and I’d suggest bringing a picnic here instead of risking the cafe. After a boat trip back to Battery Park, we walked to Washington Square. We had dinner at Alta, a very swish mediterranean inspired restaurant in a 19th century townhouse in West Village. There’s a cosy atmosphere at Alta, dishes are designed for sharing and are served on small plates. Portions are modest and prices are high here, but the food is fantastic. We arrived at the Empire State Building as it opened, at 8am. Again our CityPASS meant that we walked straight in and were whizzing up in the lift in no time. The first lift took us to the 79th (I think) floor, where the Art Deco skyscraper narrows and you have to transfer to a second lift. At this point there was a small exhibition about the building (for forty years it was the tallest building in the world), but we headed straight on up to the observation deck on the 86th floor, in order to avoid the crowds. The deck gives 360-degree views of the city and beyond. As it was another clear sunny day, and there weren’t many people on the deck, we took our time enjoying the views, taking pictures and Facetiming our families. On our way down we stopped at the exhibition, which was very interesting. Once back at ground level we walked downtown for brunch at Lafayette, a French-style cafe and bakery on Lafayette Street. We’d booked a table there a few days in advance, as it’s a deservedly popular place for brunch. The food was all very good – I had salmon gravlax benedict followed by a chunk of my friend’s lemon pancakes. We’d set aside the afternoon for art, starting with the Metropolitan Museum of Art. We took the subway to Central Park and ambled through it in the direction of the museum, stopping off at various points to watch some amazing breakdancers or to look closely at a statue or to admire the park zoo’s musical clock. Central Park is the city’s largest park, and offers hundreds of attractions across its 843 acres – there’s always something to see and it’s a great place for a wander. The Metropolitan Museum of Art (aka The Met) is next to Central Park. It’s the largest museum in the US and one of the most visited museums in the world. It contains more than two million works and is so vast that it would be impossible to see it all in one (or even several visits), so we decided to focus on a couple of areas. We saw some beautiful French Impressionist paintings and sculptures, some interesting works by American artists, and a whole actual ancient Egyptian temple which once stood on the banks of the Nile. Entry to the museum was covered by the CityPASS, with no need to queue. 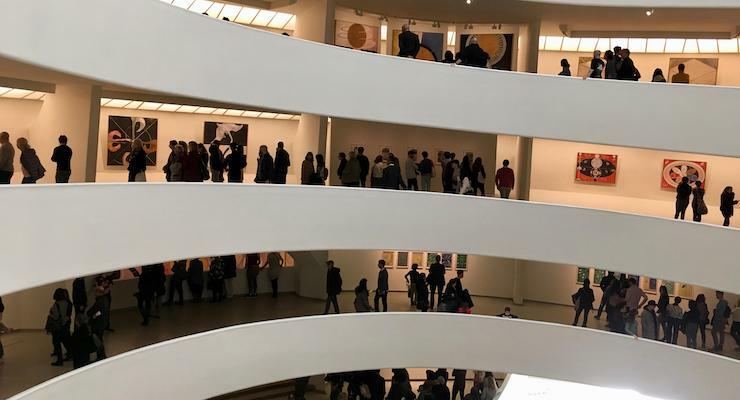 The Solomon R. Guggenheim Museum, also next to Central Park, is a five-minute walk from The Met. The museum’s astonishing and beautiful building was designed by Frank Lloyd Wright and is an architectural icon. Contemporary art is displayed along a walkway which spirals around the building’s interior, rising to a huge domed skylight. There were long queues for the Guggenheim when we were there, but our pass allowed us to go straight in, yet again. We had an evening flight from JFK. We spent the morning browsing the shops along the Washington Square end (i.e. the less expensive part) of Fifth Avenue. As I was travelling with just hand luggage, I didn’t buy anything, but there were some bargains on offer and if I’d had more space I would have bought some things. 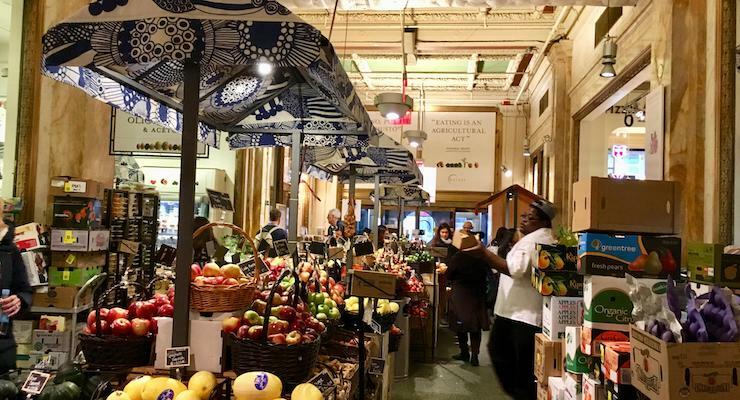 We had lunch at Eataly Flatiron, an Italian-style food hall where you can buy, eat and learn about high quality Italian food and wine. It’s a busy, buzzing place. We ate in the ‘piazza’ area of the food hall, perched on high stools at a marble- topped table. We shared delicious cheese, wine and grilled flatbreads, before heading back to pack. We took a cab back to JFK airport for the 11.10pm BA flight back to London Gatwick, arriving at 10am the following morning. You can find cheap flights from London to New York on Skyscanner. If you’re going to be sightseeing, it’s good to stay somewhere central in Manhattan. The Maritime Hotel (in West Village and Chelsea), the Freehand New York (near Union Square) and the SoHo Grand Hotel (in, you guessed it, SoHo) are all good options. I used Lonely Planet’s Best of New York City 2019 as my guide book. We’d been to the American Museum of Natural History before (it’s great) and didn’t manage to fit it in this time. This type of New York CityPASS currently costs £104.70 per adult and £85.66 per child, and you can buy it online before you travel. If you’ve been to (or live in) New York City, what would you add to this itinerary? There’s so much to see and do there, that it’s great to have tips and recommendations from people who know the city. Let me know if you have any questions about my trip. Disclosure: I was given a New York CityPASS to use and review on this trip. All opinions, words and images in this post are independent and are my own, as ever. This post contains some affiliate links, so if you clicked through and made a purchase I may receive a small commission. I’m yet to visit New York, but it’s always fascinated me. The High Line, in particular, sounds really cool. I want to be in Japonica right now! 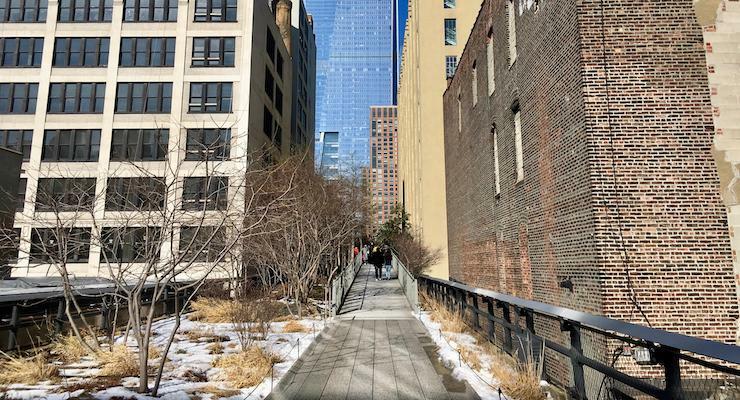 It’s great place to visit – I need to go back to see the High Line when it’s not so cold. I hope you get there one day!